The old students association was formed in October 2011. A cricket match was organized on 24th October-past vs. present. The students put up a brave fight but the past students won. 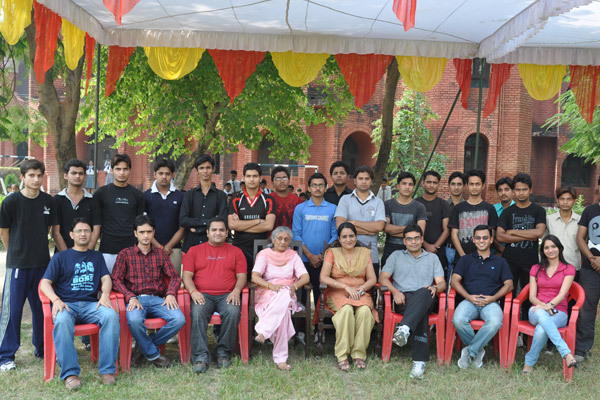 A lunch was arranged on the 25th October which was attended by about 60 students. The old students association distributed fruit in the leper’s colony on 31st December and wished them well. 1. Dr. Akshay Kumar Gupta Michigan. U.S.A.
4. Devyani and Nishant San Diego, CA U.S.A.
5. Dr. Apoorv Dutt B.D.S. 13. Mr. Neeraj Srivastava IRSME Deputy Chief Mechanical Engineer S.C. Railways. 16. Mr. Dhairya Gupta B.E. Elect. , M.B.A.
20. Mr. Saurabh Agarwal Principal Firmware Engineer IRVINE, California. 21. Mr. Mudit Agarwal Software Engineer Washington D.C.